We are engaged in offering our clients Victaulic Rubber Coupling. Victaulic Coupling is widely used in pipeline jointing. We produce victaulic rubber coupling from High Nitrile, Neoprene or Nitrile material in almost all sizes. We are offering to our clients, Rubber Couplings that are used for manufacturing couplings. These have excellent cushioning property, which help them to maintain the continuity of the pipes and offer better grip. 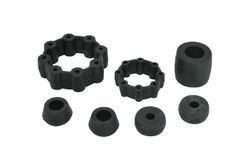 These are made using excellent quality rubber and are available in different sizes and diameters. 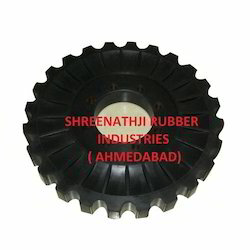 We are one of the leading manufacturer of Rubber Compressor Coupling of all size and we manufacture and supply Rubber compressor coupling as per the customer requirement. OEM Rubber Coupling for Engine Driven compressor are available for multiple brands like Atlas, Elgi, CP, IR & Kulmec. Other screw compressor spares which we can supply you. We are successfully meeting the varied requirements of our clients by providing the best quality range of Rubber Tyre Coupling.